Cassin's Auklet: Breeds from the Aleutians to central Baja California and winters in waters off the southern part of breeding range. 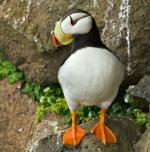 Preferred habitats include open ocean; nests on sea cliffs and isolated headlands. It is unusual amongst seabirds in occasionally laying a second clutch after a successful first clutch (it is the only northern hemisphere seabird to do so). The Cassin's Auklet is named for John Cassin, a Pennsylvania businessman and naturalist. Unlike many other auks it lacks dramatic breeding plumage, remaining the same over most of the year. At sea it is usually identified by its flight, which is described as looking like a flying tennis ball. The Cassin's Auklet is native to the United States, Mexico and Canada. The range of this bird is about 400,000 square kilometers. The population of Cassin's Auklet is fairly significant, believed to be about 5 million individual birds. 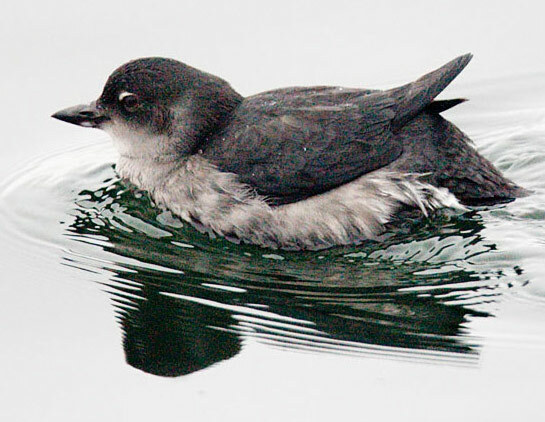 Cassin's Auklet has a current evaluation of Least Concern. 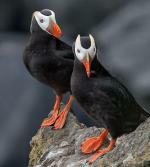 There are no current concerns regarding the decrease of the population of Cassin's Auklet. The current rating is downgraded from a previous Lower Risk rating.